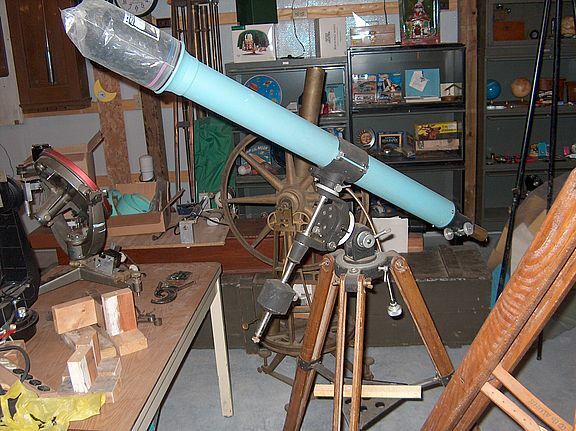 Do you still have your first refractor? It has been 33 years since I got it and I still have it. 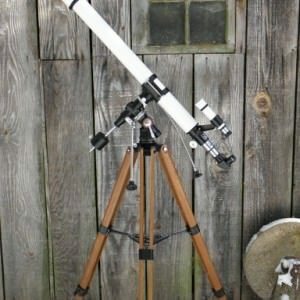 My first telescope. It was Czechoslovakian Meopta AD 800,not so great by todays standards, but it was pretty good in mid 80'. Lot of good memories. Yes, my Tele Vue F5 Genesis. 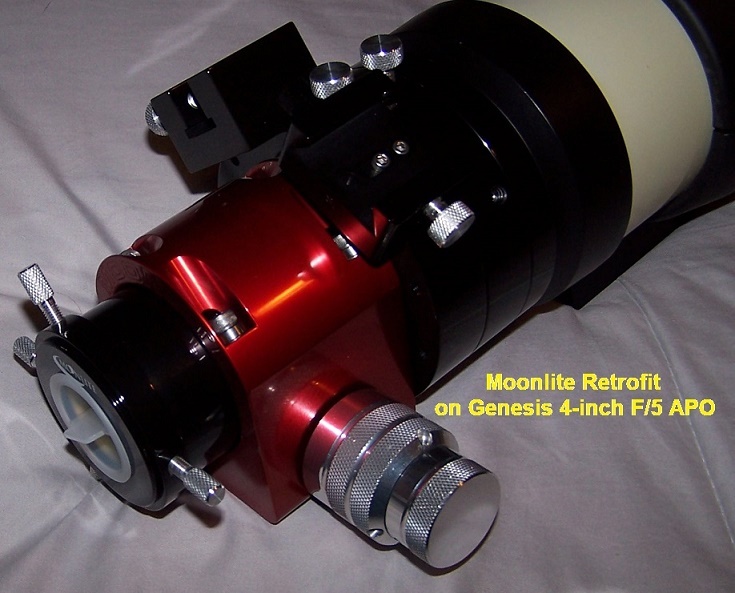 Yes, about two years ago this refractor replaced my ten year old MCT which replaced my forty plus year old Newtonian. No way. It was a Tasco 60mm back in the mid 60's. Alas, no. Though I wish I had. Still have it, though many in the meantime are gone. Last year I repurchased a Tasco 7TE-5 which is the exact same year and appointments as my original I purchased in 1968. Wooden case in great shape and the scope looks like new. I had loaned the original to my sister's first husband in the mid-70's. When they got divorced, I never saw it again.... I'm never letting this one get away ! I have pieces of it. I tried to watch the moon landing with it. I have and still observe with my 1956 60mm SPI. Definitely a keeper. Yep, my AT115EDT. I think it's a very fine scope and plan to keep it too. Its a Stellarvue SV80ED I bought back in 2009. I had already been using my first telescope (NexStar-6SE-XLT) for about two years, and I had a work trip to Canada so I wanted to try observing with a couple of work mates out in the Northwestern area outside of Ontario. No i don't have my first telescope from BOB Germany. It was stolen... and after all these years i still can get (very) angry when i think about it. Yes, a Jason 313 that i got about 35 years ago... in high school sitting in my office/movie room fully set up and ready for grab and go. still use .965 eyepieces with it that i have collected. still have the original eyepieces but they were by no means premium but the gimmes that come with a scope are usually from the money saving end of the selection from the manufacturer. My Jason 60x720 is long gone. Optics were good with a nice Plossl.......tripod was a horror. Wooden legs very good....horshoe alt-az...horrible. .....it's a lot of fun letting people look at planetary details. The focuser on the Meade is oddly great for a plastic rack.  Edited by MartinPond, 23 March 2019 - 12:45 AM. I still have my Skywatcher 6 inch achro that I purchased in 2002.i like it so much I got another to keep it company as a bino scope. I don't remember disposing of my first one, a Jason 60mm something or other. I bet it is packed in its box in my ex-wife's attic. Archaeologists will be thrilled to find it some day. 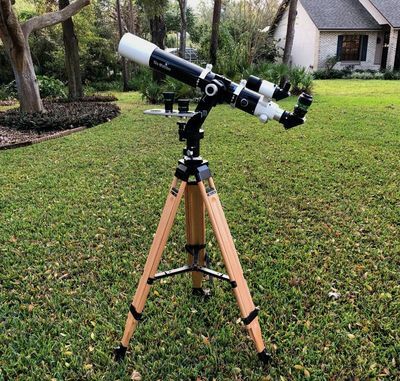 My first refractor, my first telescope was a nameless 60 mm F/15 that I purchased at a garage sale more than 30 years ago. I paid $5 for it. One eyepiece and no finder. The mount was missing pieces and I ended up lashing it to an equally worn-out department store photo tripod. With 3 boys to raise, that was about what I could afford. I was ignorant, I had no great plans or goals, I just wanted to look around and see what I could see. It was enough so that early one morning out on the Arizona desert, serendipity smiled upon me, I stumbled upon a bit of nebulosity that turned out to be the Orion nebula and that was the spark that lit the flame. At the time, we lived in a 2 story duplex overlooking both the freeway and the ocean and I kept the scope on the second story balcony. On day I came home from work, the neighbor's ladder was leaning against the balcony and the scope was gone. By my standards of today, it was a very poor scope on a terrible mount but it was enough to open the door. Today I have much better equipment, I know a lot more but at the most fundamental level, I still have no great plans or goals, I still just want to go out each clear night and see what I can see. Coming from such humble beginnings, I have admiration and appreciation for those who make their way about the night sky with the most modest equipment.. I'll have to check the serial number on mine. 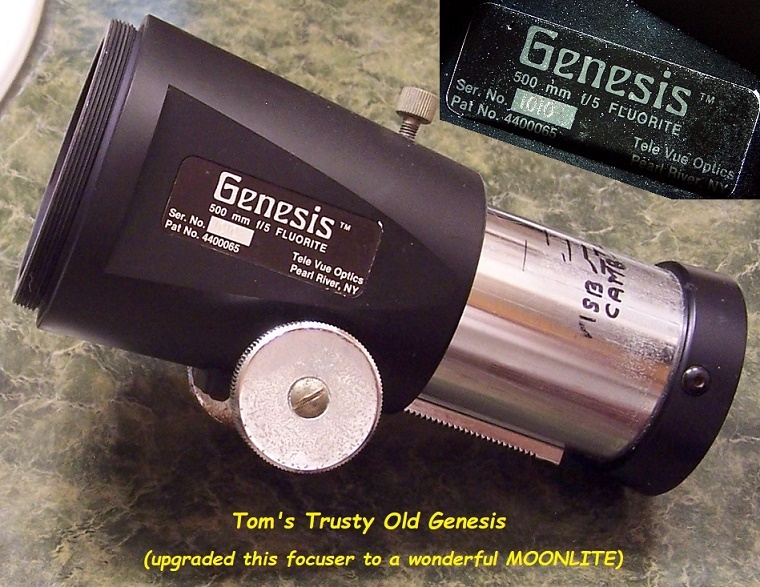 I have never considered wholly replacing it's focuser, but a fine focus mod to the OE is tempting.